The garden has been turned; the seeds have been purchased; radishes will be growing soon. It is exciting to consider spring time is coming fast and I'll be putting seeds in the ground very soon. I always have tomatoes, zucchini, lettuce, and sometimes basil and radish in my garden. They make lovely subjects for painting and I won't have to purchase my subjects from the grocery store like I did for this little bundle of color. 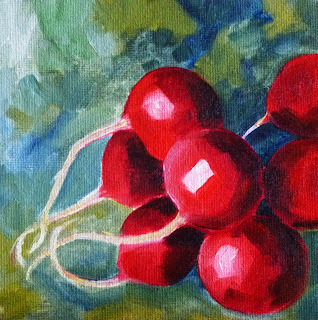 This painting is 6x6 inches on a canvas panel. It recently SOLD, but you can find other small paintings for sale in my Etsy shop. 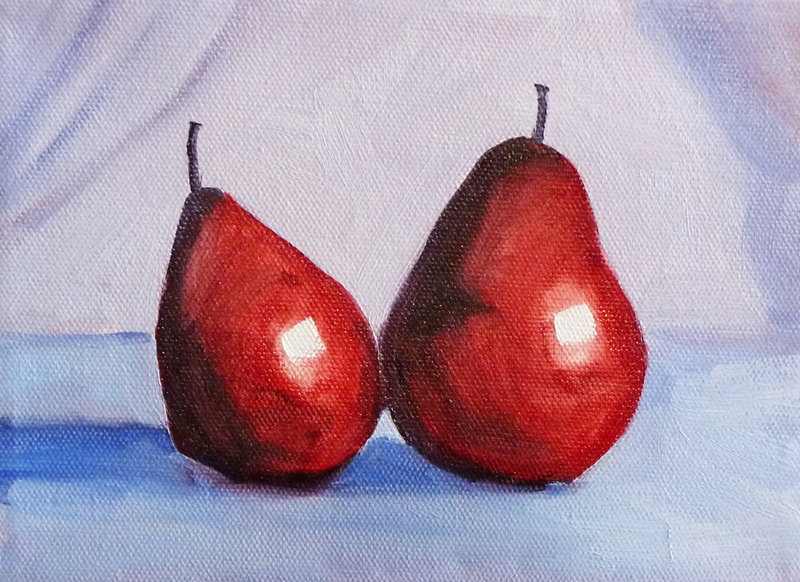 The pears keep appearing and reappearing in my studio. This is another that just seemed to pop out of nowhere. 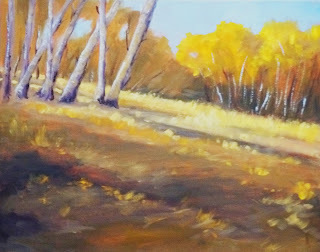 Originally this painting started out as a study in glass. I love painting glass and have a small collection of bottles, bowls, and other sparkly glass items. To begin, I sat three bottles on the table. It was boring. Although the glass had that spark that inspires me, the color wasn't very exciting. Then this yellow pear meandered her way onto the set and bam--it was a go. The painting is 8x10 inches on a gallery-wrapped canvas. 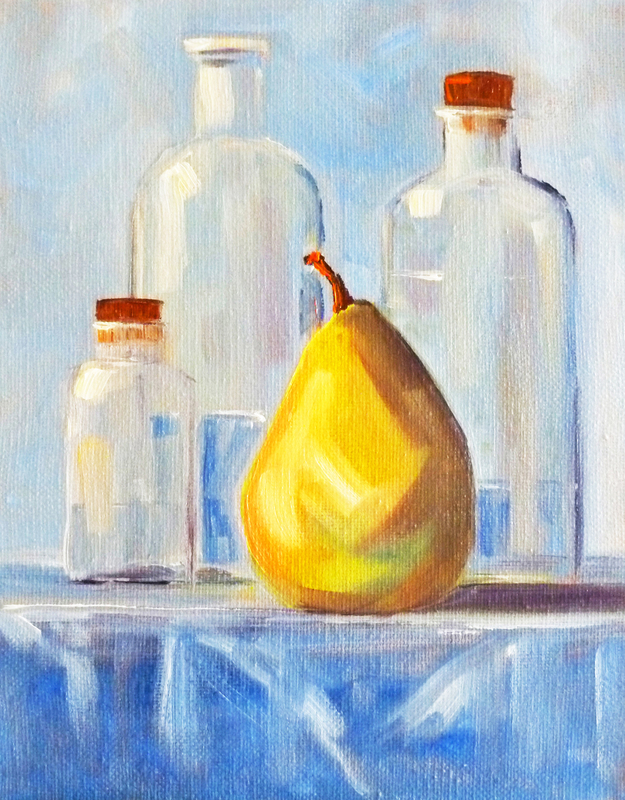 It is for sale in my Etsy shop along with some of my other still life and fruit paintings. My other addiction is painting chrome and shiny metal objects. I'm sure some of those items will be appearing here soon. There will probably be a pear in the mix. Those pears seem to be pretty consistent at crashing the party--but with such colorful personalities, who can resist? 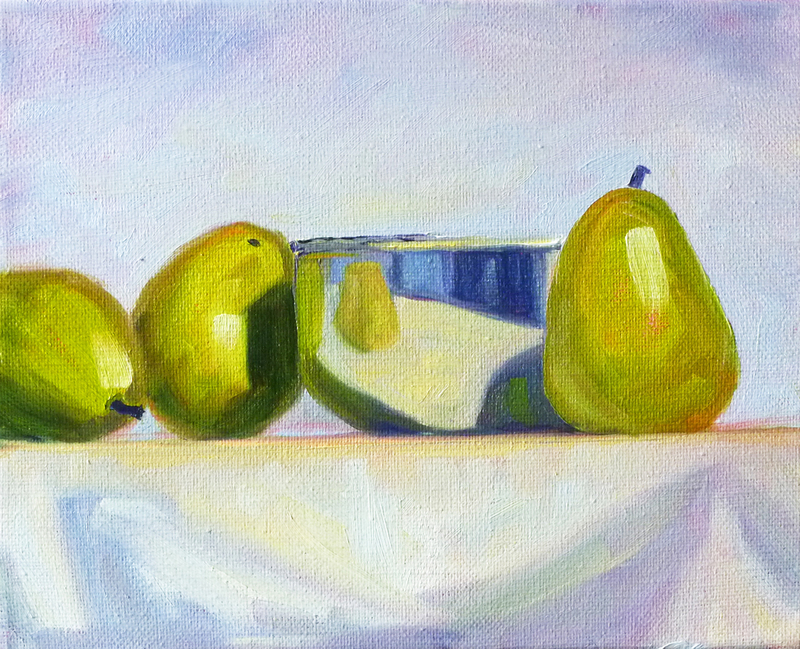 Today's painting was inspired by a couple of things: my lunch and a shiny stainless steel bowl. I've used this bowl in a number of still life paintings. It is one of my favorite items for still life painting because it is so much fun to include the reflections. I've also painted it with orange slices and apples. Clicking on the links will take you to see some of my other paintings with this shiny little bowl. This painting is 8x10 inches and is currently for sale in my Etsy Shop, Small Impressions Paintings. View it in the shop or make a purchase by visiting this link. Everyday for lunch lately, I've been biting into one of these crunchy pears. Sometimes they are red, sometimes they are yellow, sometimes green, but always delicious. It seemed inevitable that they would be painted. This pair is for sale at my Etsy Shop. Click here to view them in the shop or make a purchase. Today's painting is a little larger than my usual. Sometimes I just need to get away from small. This painting is 11x14 inches on a gallery-wrapped canvas. It feels good to use larger brushes, cover more canvas, and do something a little different. The painting is available for sale in my Etsy Shop by clicking here. We are on the countdown to Easter. Birth and new life remind us that spring is here and the dark months are behind us. This portrait is a tribute to the season. Capturing the light was my goal. 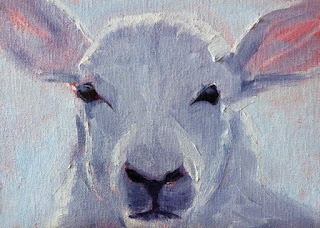 With the light behind him, the ears of this little lamb took on a soft pink glow while the white of his wool was apparent only around the edges of the figure. He is on a 5x7 inch canvas and SOLD in my Etsy Shop but I have other original small format oil paintings of birds and animals still for sale. Check it out here.